I’m glad that it’s still Sunday night and not quite Monday morning. I still have the chance to get my mind right about going back to work tomorrow. If I wanted to be glass-half-empty about things, I’d focus on the weight I’ve gained since I’ve last seen my coworkers and how much work might be waiting for tomorrow. While I’ve behaved like that a thousand Monday’s before, tomorrow will be different. Why? I intend for it to be different. I can start the day with a positive glass-half-full attitude. No one control over my attitude but me. In the past, I’ve gotten particularly caught up in listing the challenges and things that have gone wrong. My goal tomorrow, is to stop and take a small break and refocus on being positive if I feel overwhelmed. Even that little word “if” in that last sentence is a new step. My typical M.O. is to say “when” I feel overwhelmed. I have found if I declare things, they manifest. Some might find that hokey or roll their eyes, no problem, you can have your own opinion. However, when I stopped saying “This is making me crazy!”, fewer things made me “crazy.” I don’t want to give labels power over me that they don’t deserve. I am determined to keep telling myself how great I am and how capable until I no longer need the reminder but I believe it. Sadly, I don’t right now. My self esteem is a little low and it’s up to be to boost myself out. Counting on external “atta girls” and compliments, is a losing proposition. I’ll be happier to do the best I can, recognizing that being good enough, is just that. I am looking forward to a better balance. Of leaving home and home and work at work. I’ve talked about that before and it’s time to renew that commitment to better living through balance. That won’t look the same to everyone. It was also require an adjustment period to those who are used to interacting with me a certain way. Before in my life, I’ve had to ask loved ones to “Please, give me a chance to do and BE different.” Unpredictability can be intimidating and unsettling to people. Not everyone I know will have read my blog and realize that I am kicking the Reinvention of Rebecca into high gear. Some may have. So long as I offer those around me the compassion and patience that I would like to receive, WITHOUT paying any attention to what I am receiving, I will stay on the right track. To share the love of Jesus with those around me can be so simple. I LOVE to make things complicated, people have said about me. I don’t love it, I’ve done it, sure, but I don’t love it. I don’t want that anymore. I intend to simplify tasks without second guessing or judgement. I may struggle and have periods of failure and I can manage those times without despair and self-loathing. I don’t necessarily know exactly what that might look like, and that’s ok. This weekend camping with the family was fast-paced and busy. 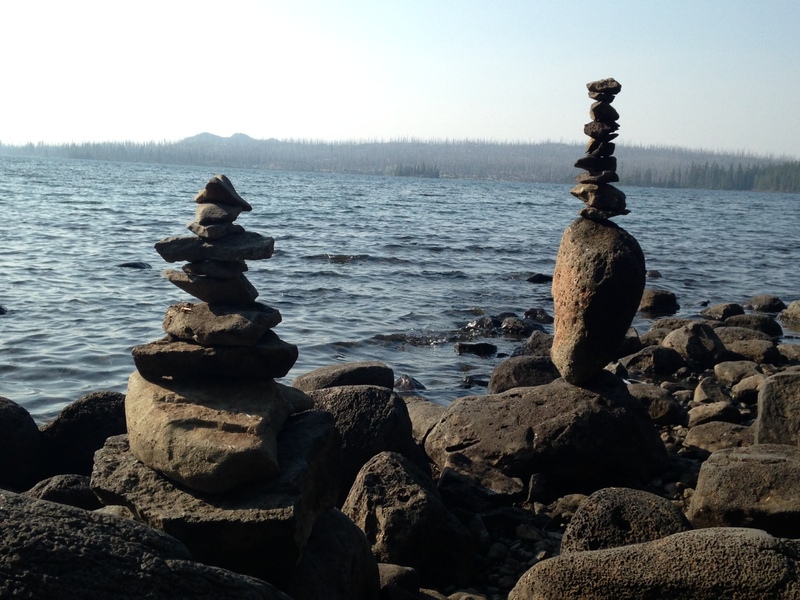 In the stillness that I found on the beach at Waldo Lake, I did spend time reflecting on what I want to keep and want I want to leave behind. What I want to keep is being transparent and sharing what is on my heart. This blog gives me a chance to do that. If no one reads it, no worries. The words and thoughts and feelings are here to remind me where I’ve been and even where I’m going. We discovered this weekend that our compass is upside down. A funny thing for a LetterBoxer who prides herself on being prepared for everything. I didn’t cringe, I laughed it off. No negative self talk or self depreciating comments came from me. What I can give to the world, staring with myself, is more encouragement and cheer-leading. Dear Lord, Thank you for giving me each new day, ESPECIALLY Mondays, to wake up and praise your name and be grateful for the blessings you have bestowed upon me. You are my ROCK! Amen.